I don’t know how many of you plan to bring children into this world. I also don’t know whether you plan to jump-start this process in the next year, or in the much more distant future. But regardless of your personal procreation strategy, I beg of you: do not conceive in March. In fact, just to be safe, avoid April, too. Because if you choose to get pregnant during those months, you’re getting a December baby, and there’s a good chance your kid will never forgive you for it. Everyone knows Christmas kids are doomed from day one, but as any radio DJ or CVS manager could tell you, the holidays are in full swing the second Thanksgiving ends. So really, anyone celebrating a birthday in the last month of the year is in for a bad time. They can plan and accommodate and adjust all they like -- there's no way they're beating back the festivities for even one night. I know: I was born just four days shy of 12/25. And since I've already spent a good deal of my life griping about it, I thought it was time I offered a definitive, self-pitying essay for all my brothers and sisters with the world's worst due dates. I wish I could say it gets better, but we all know that's not true. Just how bitter you are about your December birthday depends a lot on your childhood. No matter what, it’s gonna be at least a little ruined, but there’s a world of difference between "got a few less cards" and "got old candy canes instead of a birthday cake". 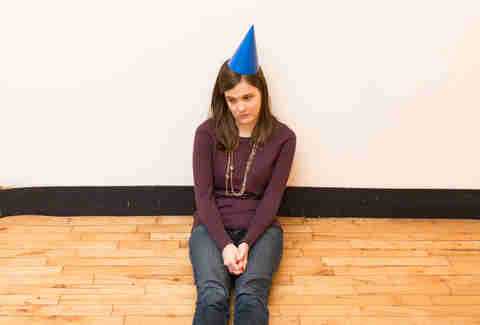 You'd think teen birthdays would be the most dramatic, since teenagers are such naturally sulky creatures, but all your friends are still living at home, and bored, and usually unable to throw a conflicting, raucous Chrismukkah party. Plus, all anyone wants to do at that age is listen to Dashboard Confessional in their room and think about how only J.D. Salinger gets them anyway. 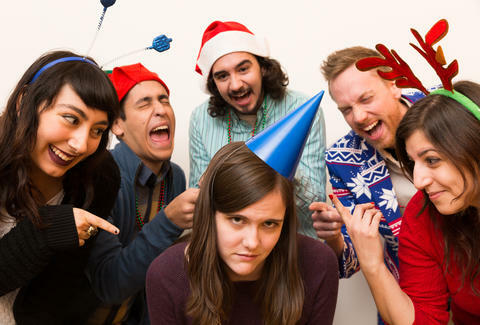 If people actually do snub them in favor of the holidays, it just feeds their moody egos. No, in my experience, it's during adulthood when you abandon all hope. The early years are when you get your first taste of disappointment, but if you hadn’t learned to manage your expectations as a fifth-grader, you catch up fast once you’re a grown-up. Because when you’re a kid, the actual parties aren’t really your problem. It’s on your parents to organize those things, and your friends’ parents to make sure the guests show up. But things get aggravating real fast once the responsibility shifts to you. While most people just make a Facebook event two weeks out and trust a crowd will show up at whatever bar they’ve chosen, that’s not how it goes when your birthday falls in the most unfortunate month of the year. For us, planning a party is as stressful and labor-intensive as scheduling a wedding... when almost all your guests refuse to RSVP. But all the other people I invited? “Gotta go to a cocoa party in the park!” "Bummer, I'll already be home for my 40-day holiday vacation!” “My boyfriend’s third cousin is actually having an ugly sweater party!” Those excuses are even lazier than Garfield, yet I'm supposed to act like they're totally valid reasons and not take it personally. I'm also expected show up and buy those a-holes shots when their more convenient birthday rolls around. Which I do, because the alternative is to have a crappy birthday plus no friends. Once I've managed to put together a motley crew of revelers, there's still a solid chance Christmas will overshadow the whole thing. Last year, all I wanted to do was grab dinner with a few friends and then head to a bar to drink and play board games. Do you know what happened when I showed up at the restaurant? It was overrun with inebriated dudes in Santa suits. Because even though the New York scourge known as SantaCon was taking place a solid 50 blocks away, those guys managed to stumble all the way up to my location, turn my wait time into an hour and 20 minutes, and then further taunt me at the adjacent bar I retreated to. By the time I actually got to eat, I was a miserable grump who just wanted to be alone with her angsty thoughts, and maybe a pile of Santa hats soaked in kerosene. Due to all this drama, many December babies choose to just celebrate at home with their family during the holidays. And do you remember the last time you had a good night with your weird cousins from Muncie? Exactly. A lot of you smug jerks with summer birthdays are probably thinking, "Kristin, aren't you being a little dramatic? Who really cares about their birthday past the age of 21?" But do you actually realize why we December babies get so worked up about this? We aren't asking for a four-day booze cruise here. We just want a nice, normal acknowledgment of our birth -- and somehow even asking for that makes us feel like we're placing an insane burden on our friends and family. Those same people who, by the way, are kinda ignoring us. We get that you guys aren't being intentionally neglectful. 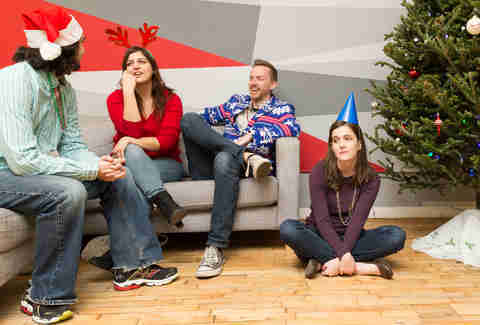 It's just when you’re all gallivanting around ice skating, wishing complete strangers happy holidays, and generally being jollier than Santa on Percocet, it comes off as especially callous when you forget to text us happy birthday. Or present us with a gift you obviously picked up at your White Elephant office party. Seriously, we can see right through that singing monkey tape dispenser, so don't even try it. The most messed-up part about the whole thing is that we aren't even allowed to complain about being shunned. No matter how carefully you word your case, all anyone's going to hear is, "I hate the holidays", and people who hate the holidays are less popular than fruitcake. The only person you can actually grumble to is a fellow December child. And seeing as we're conditioned not to voice our grievances, it's hard to spot brothers-in-arms. Especially since they're usually in a corner, crying and raging against a Frosty the Snowman figurine. Admitting defeat I really wish my birthday could coexist with all this merriment, because I actually love Christmas. Even the corny, lame stuff I’m supposed to act like I’m above. I still freak out when I realize it's the day of the Rockefeller Center tree lighting. I have a $5 paper star lantern from the Berlin Christmas markets that I value more than my TV. And in fact, I'm even listening to Stevie Wonder holiday jams as I type this rant. But unlike those imaginary holiday jihadists Rush Limbaugh loves to rail against, I know any "War on Christmas" is unwinnable. The holidays will always creep in. So on second thought, I think I will take that new birthday declaration. It’s now officially April 25th. Be there, or be dead to me. Kristin Hunt is a Food/Drink staff writer for Thrillist, and will be spending her birthday in Philly this year, watching Syracuse beat 'Nova. And then probably singing "All I Want for Christmas Is You" at some karaoke bar. Follow her to cups of mulled wine at @kristin_hunt.